Lux pL controlled LuxR with lux pR autoinducing LuxI(lva tag)- AHL. A schematic representation of the BioBrick sub parts' interaction. lux pl-RBS-C0062-B0015 produces LuxR. 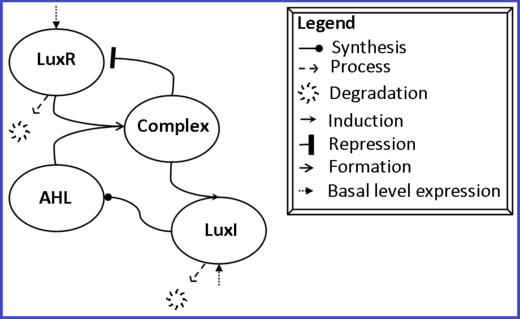 LuxR forms a complex with the quorum sensing molecule AHL and this complex subsequently increases the transcriptional rate of the lux pR promoter while also decreasing the transcriptional rate of the lux pL promoter. The quorum sensing molecule AHL is produced by LuxI which is under the control of the lux pR promoter. In combination with LuxR, AHL thus increases the production of AHL, a positive feedback loop. The GFP expression rapidly increases, indicating functionality of this part. The formed AHL from LuxI forms a complex with LuxR and induces pR, that controls GFP expression. As a result, a positive feedback loop is initiated. 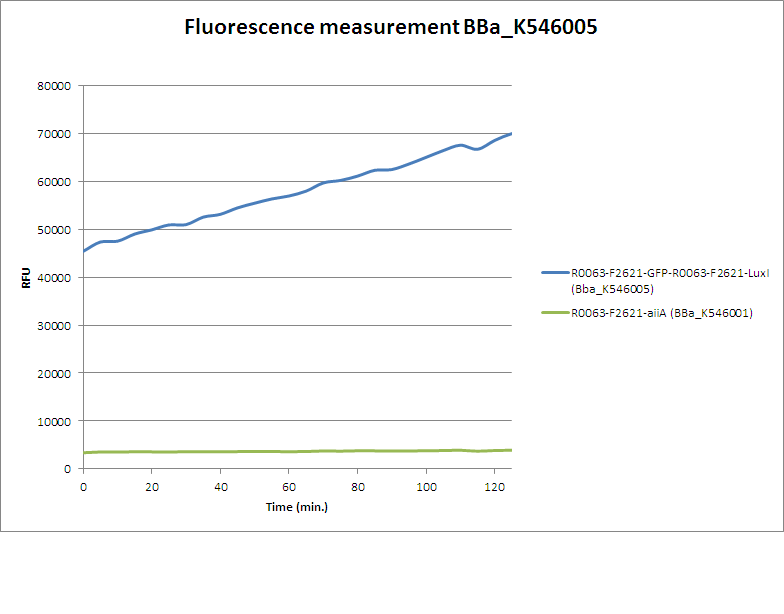 We have improved the characterization of BBa_K546000 by testing it with a reporter on a separate plasmid, something not done before. Up to now this parts functioning had only been assessed when combined with another part into one new biobrick (main page). 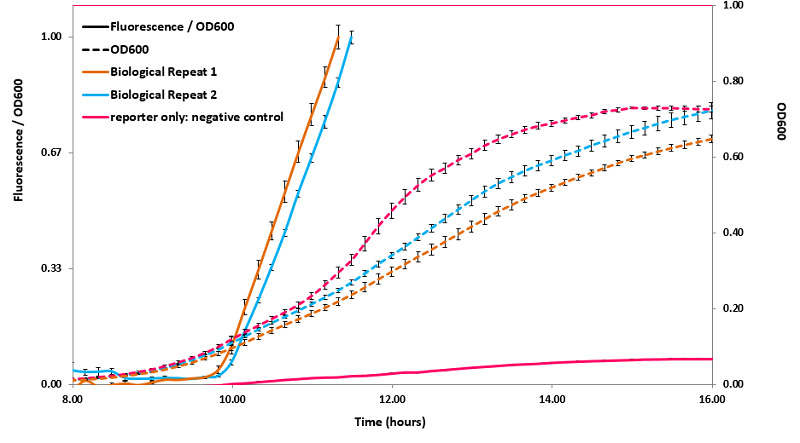 Our characterization also spans a far longer time than previous analyses and shows the dynamics of part BBa_K546000 during bacterial growth. 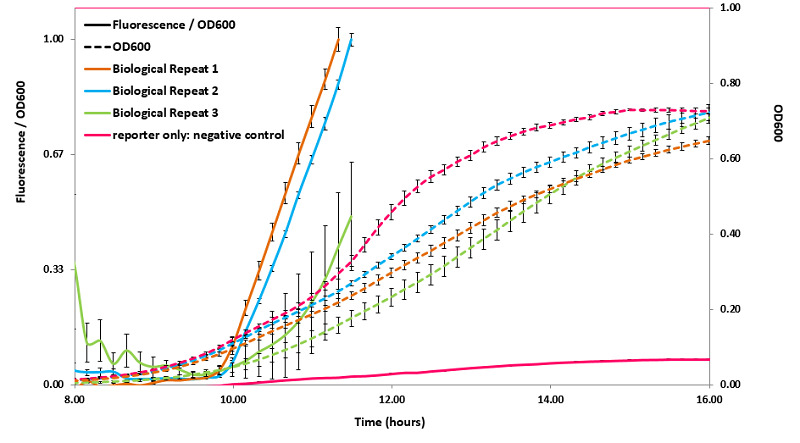 To provide future teams with an easy quorum sensing system that reports activity itself, we created and submitted part BBa_K1913005 to the registry. There's a small note regarding the biosafety of this BioBrick composite part. Upon release into the environment (this includes infection of a laboratory worker) this BioBrick composite part might alter the pathogenicity of pathogens that rely on quorum sensing to infect hosts. Pathogenic species that might be involved can be found on the following external biological safety page.